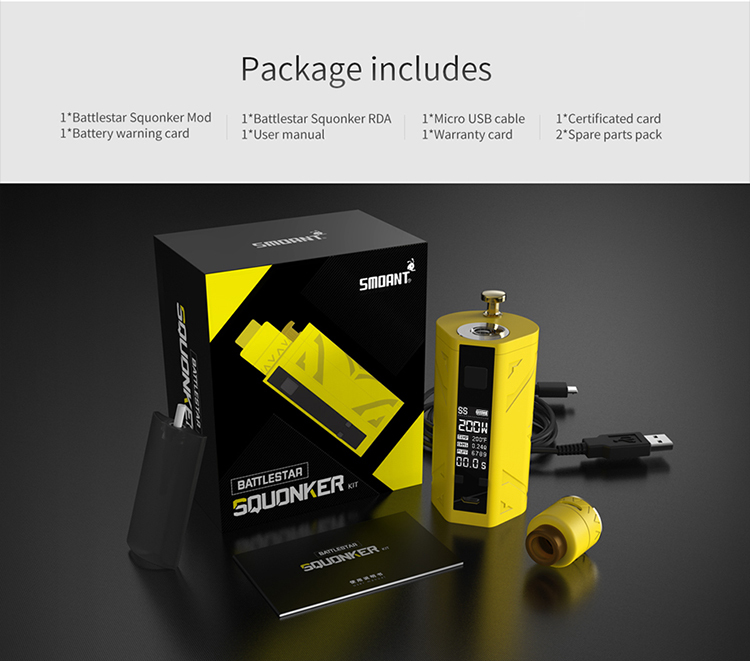 Smoant Battlestar Squonker 200W Kit contains a Battlestar Squonk Mod and a Battlestar Squonk RDA. The Battlestar Squonker Mod is made of Zinc alloy and PMMA, it comes with compact design and supports various modes to achieve different vaping experience. It is powered by dual 18650 batteries and is capable of 200W maximum output. What's more, the mod adopts trigger design to control liquid flow and prevent liquid coming up into the RDA. It is equipped with 0.96" OLED screen, which displays data clearly. The mod is built-in a 7ml oil bottle for feeding RDA conveniently. The Battlestar Squonk RDA features dual coil build deck, the side airflow holes allow air hit into coils directly, bring massive clouds and better flavor for you.